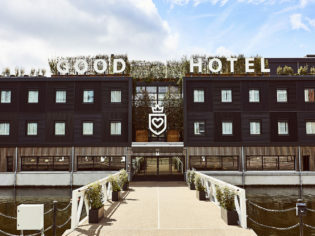 We test out Good Hotel: a new-breed, social-good hotel, lugged to London over water from Amsterdam. A hotel with a cause is not something you come across every day. Especially not one that’s been designed in the Netherlands, before being barged along the North Sea Canal and over to the River Thames. The eight-million-kilogram Good Hotel spent a year in Amsterdam where about 100 long-term unemployed were trained in hospitality, before it took its mission to the UK. I’m all for supporting those who work hard to climb the ladders of life, so I’m on board with the concept before I even see that the hotel fits into the quirky, design-oriented, boutique style I favour. It turns out chic-budget digs asking under £100 per night are trending in London, and this one is part of the new wave. Plus £5 ($9) from every direct booking at the Good Hotel, per night, is donated to underprivileged kids – even better. I click ‘book’. A moment’s walk from Royal Victoria DLR station, I’m greeted by what looks like a mass of grey sea containers stacked on a floating platform, linked to the docks by a drawbridge. Pulling my roller bag to the entrance, I feel like I’m boarding an ocean liner, only with large, square windows. Inside, it’s a freelancer’s dream. Felt chairs mingle with pine stools on sand-hued mats, pastel ottomans and grey couches are strewn with cushions and a mix of statement light shades and Edison globes deliver a decidedly hip vibe to the painted black interiors. Check-in is streamlined – I’ve pre-entered most things online – with the only disappointment being advice that the rooftop is closed for an event. I’m soon in a rather industrial lift heading to my room – one of 148. Its pale grey walls are bare; there’s no TV or USB points but, for London, it’s huge – I wonder if I got upgraded and they forgot to mention it. My king-size bed is dressed with crisp, clean linen, and there’s complimentary sparkling water and appropriately moral bathroom accessories by FAIR CosmEthics. It’s pin-drop quiet overnight. I’ve sprung for views and the scene of frigid Brits swimming in the crane-dotted docks the following morning is well worth it. Before setting off for the nearby Emirates cable car (a cheap and sensational aerial adventure), I’m wowed by the high-end brekkie spread. Fresh blackberries, dried cranberries, mini Bonne Maman jars and French pastries are served among the usual suspects. The floor is packed with people of all ages from all over the world, all looking as pleased as I am that we chose to be Good. 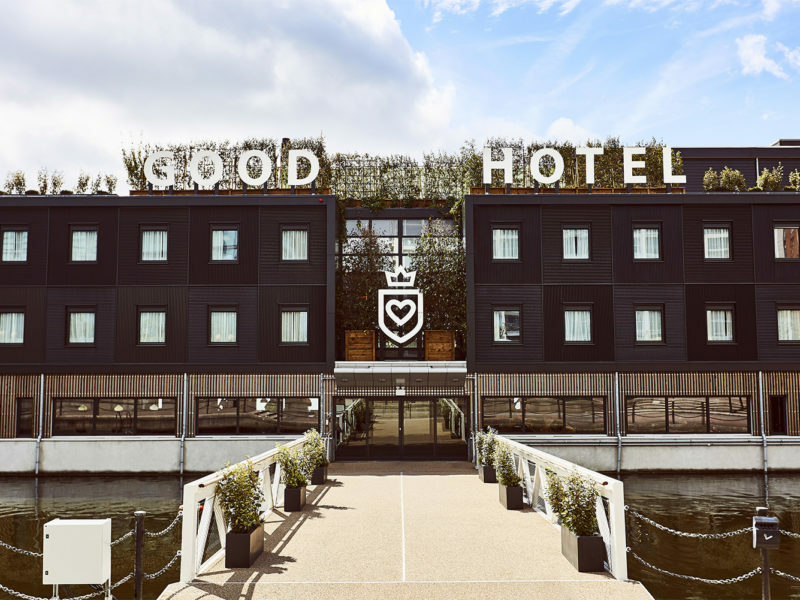 A modern, industrial-chic hotel with double-barrel attractions: it engages in social good while offering some of the most affordable, quality rooms in London. It’s a 40-minute, two-tube ride to London’s heart – but the dockside views make up for it. Budget doesn’t mean boring; trendy communal areas, free fruit and mags invite you to linger. Service is impressively polished, and staff have good knowledge of the local area. Minimalist with limited mod cons, yet my ‘deluxe water view room’ was spacious and the essentials well above average. This is one of the biggest and best brekkie smorgasbords I’ve seen, and for £13.50 ($25) it’s worth indulging. – I paid just over.